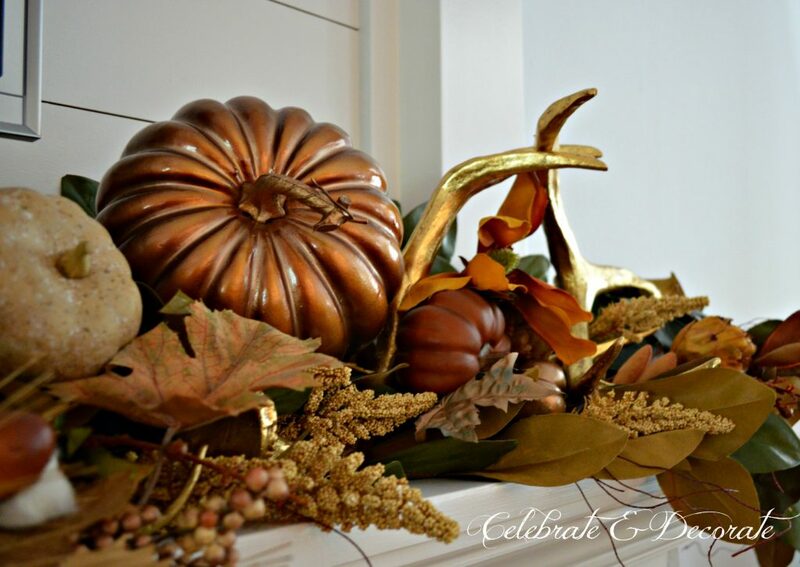 I have shared a Fall tablescape, my mantel and my front porch, but now it is time for a Fall Home Tour! It has been so exciting to have my house for over a year now, so I am falling into a routine as far as decorating for the holidays and the seasons. We had friends over on Friday evening and they thought I had added the extra leaves on the steps for atmosphere, alas, the Sycamore trees drop so many leaves at this time of year that I can’t keep up with them. 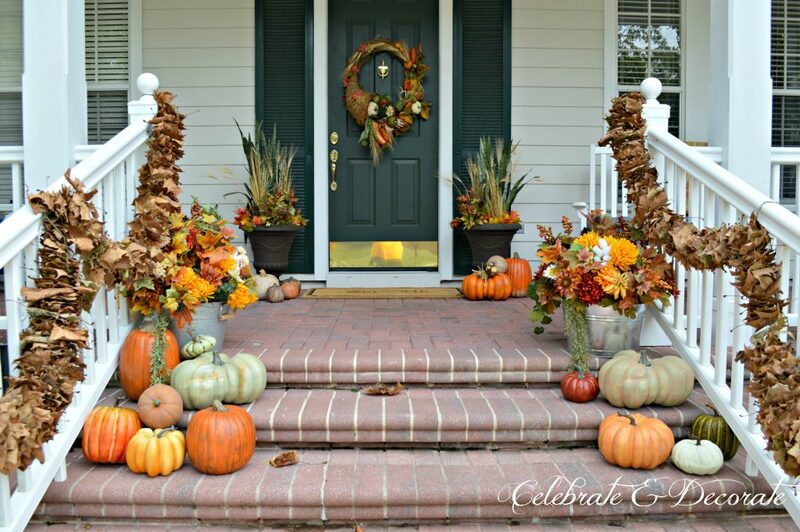 My front steps are stacked with faux pumpkins and two big galvanized tubs overflowing with mixed Fall florals. The leaf garlands were a new DIY this year. It was very easy to thread leaves onto yarn. 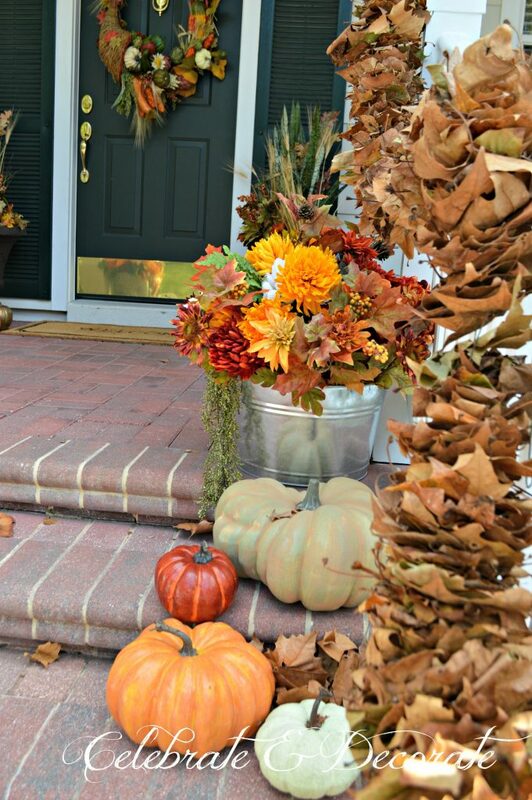 Here is where you can see more of my Fall Front Porch. 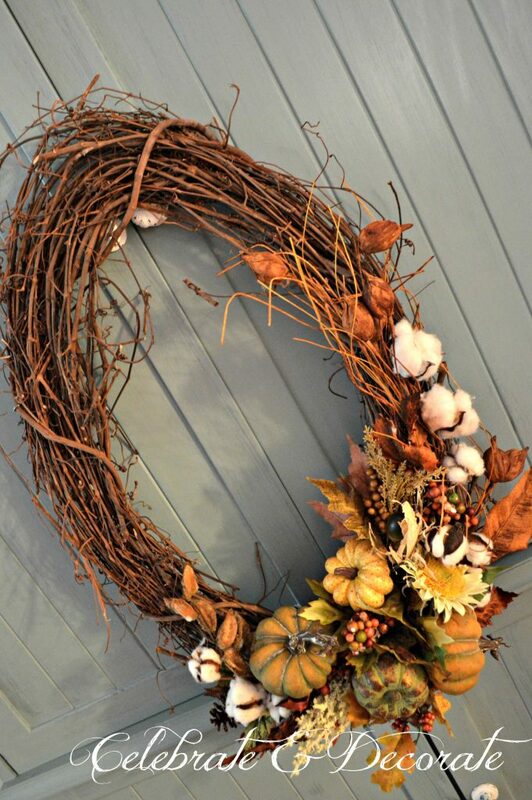 You can see more and the tutorial for making a Cornucopia Fall Wreath at my post. We have had a lot of guests this Fall and Winter should be no different with friends and family looking for a break from the cold and snow up North. 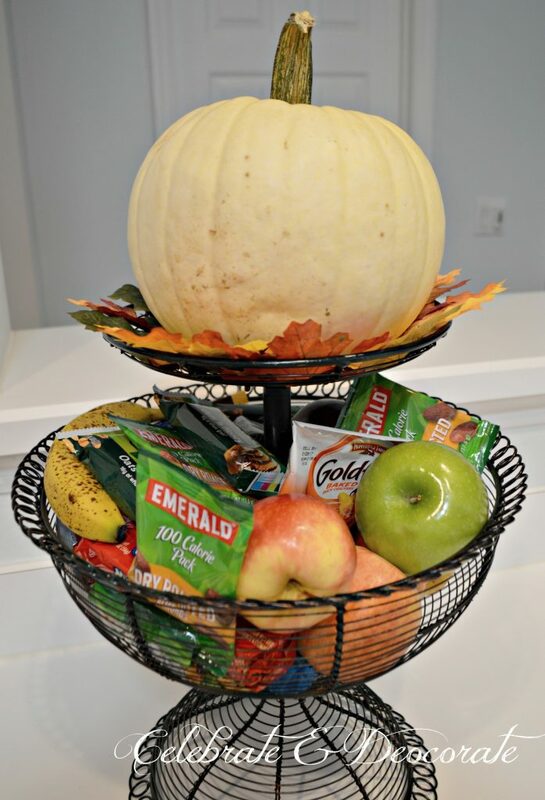 I have gotten in the habit of keeping this tiered basket full of snacks on the kitchen counter so that guests might help themselves to a snack when they might like. 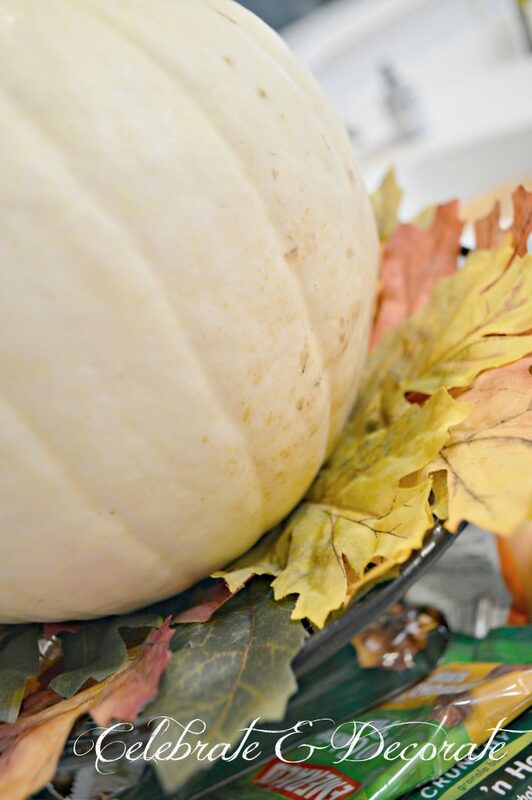 It only seemed fitting to top my baskets with a white pumpkin with pretty Fall leaves tucked beneath it. 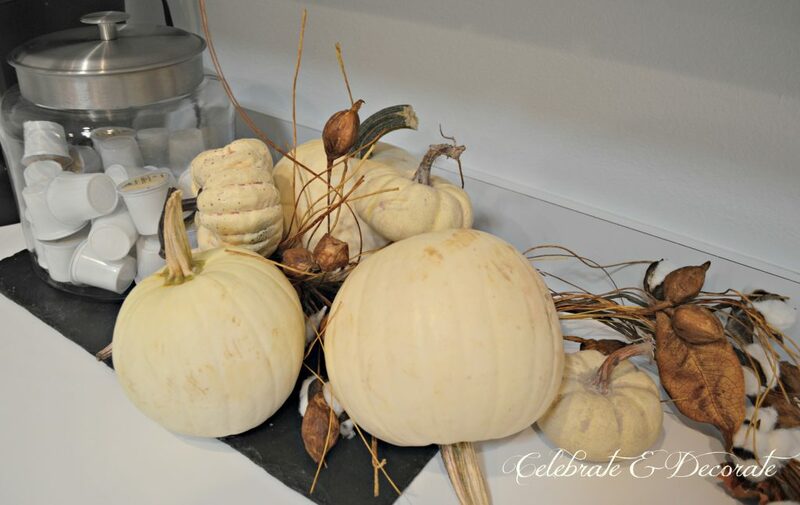 Next to my coffee maker I clustered some real white pumpkins mixed with some tiny faux ones and tucked a cotton boll garland around them. In the master bedroom is this lovely armoire that I painted a few months ago. 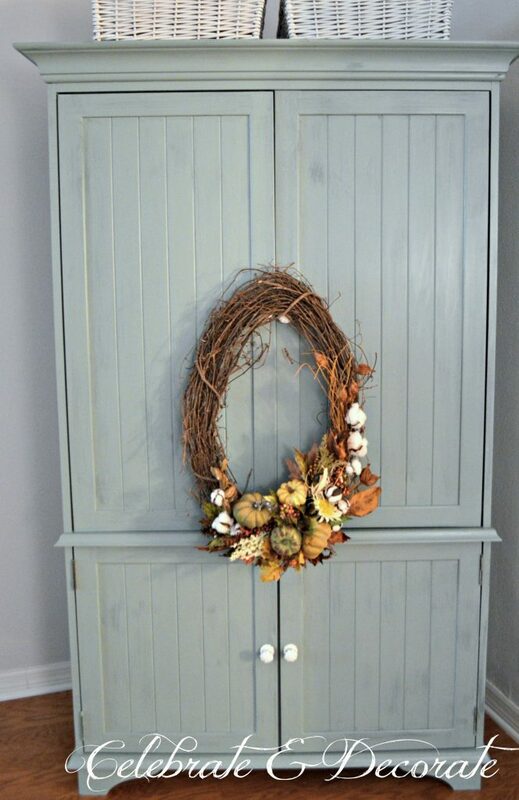 The transformation was fantastic from an outdated black armoire with this pretty blue milk paint. 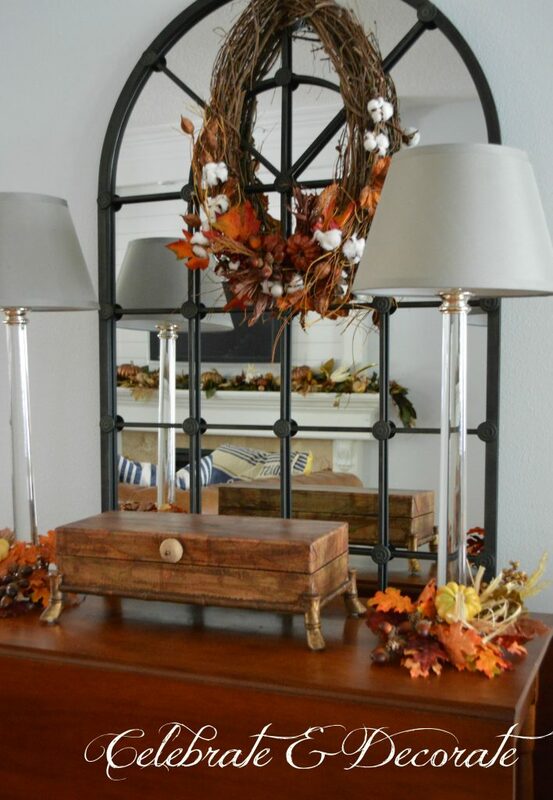 This seemed like the perfect place to add a touch of Fall to the bedroom and this oval wreath was the perfect choice. I put this together with some Fall picks and leaves. Oval seems to be my favorite for wreaths this year, at least for my indoor decorations. I think the narrow shape is a little more delicate. 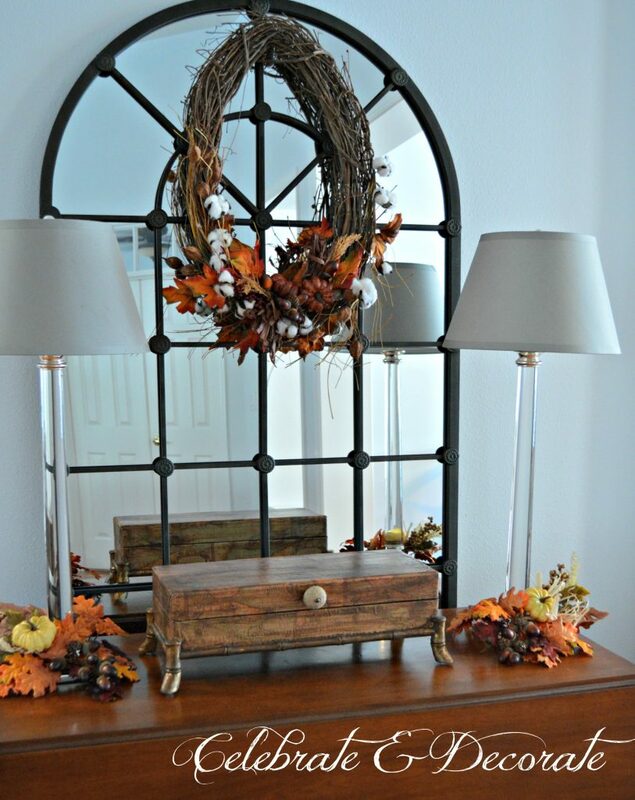 I know this wreath looks similar, but this is another one I put together to hang on this arched mirror in our family room. This antique table from my grandparents sits in front of the tall mirror and holds a pair of candlestick lights. I simply took a pair of Fall leaf candle rings from Hobby Lobby, clipped them so I could place them around the the base of the lamps. I added a couple of Fall floral picks to the candle rings for an extra touch of Autumn. 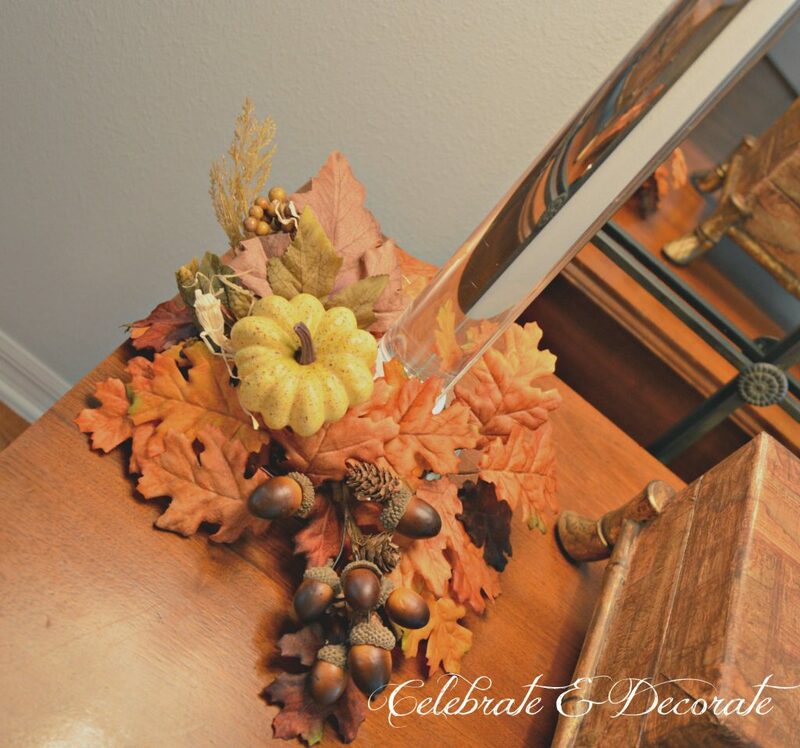 The mirror is reflecting not just the wreath and decor on the table, but also the mantel which is all dressed for Fall. This mantel is crazy long, but it makes for a showy centerpiece in the family room loaded with magnolia garlands, pumpkins, gourds and golden antlers. 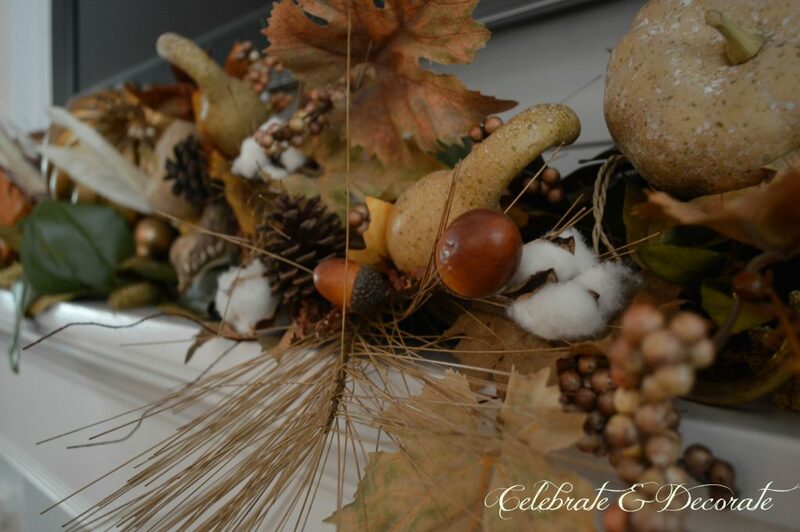 I mixed in cotton boll garlands and picks along with some other Fall picks to make a bountiful display display. Along with the long mantel is a wide hearth, so I had to add some decoration to break up the massive size of it, too. 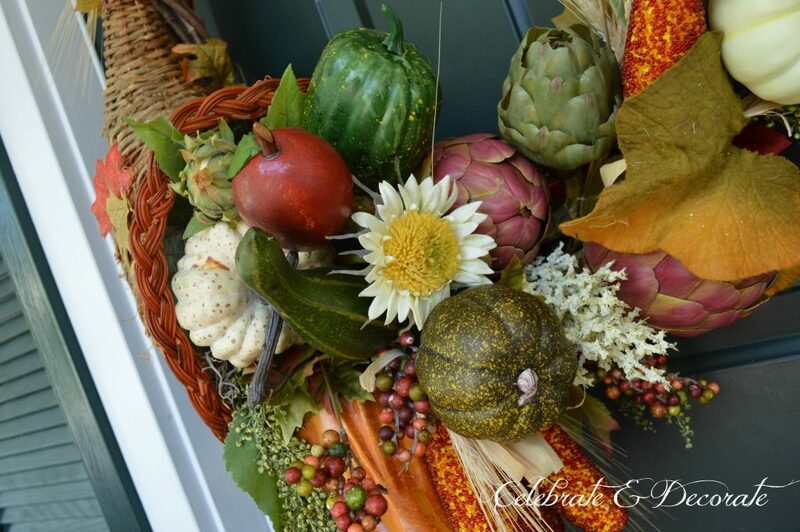 This bushel basket is overflowing with Fall florals, pumpkins, gourds, leaves and berries. 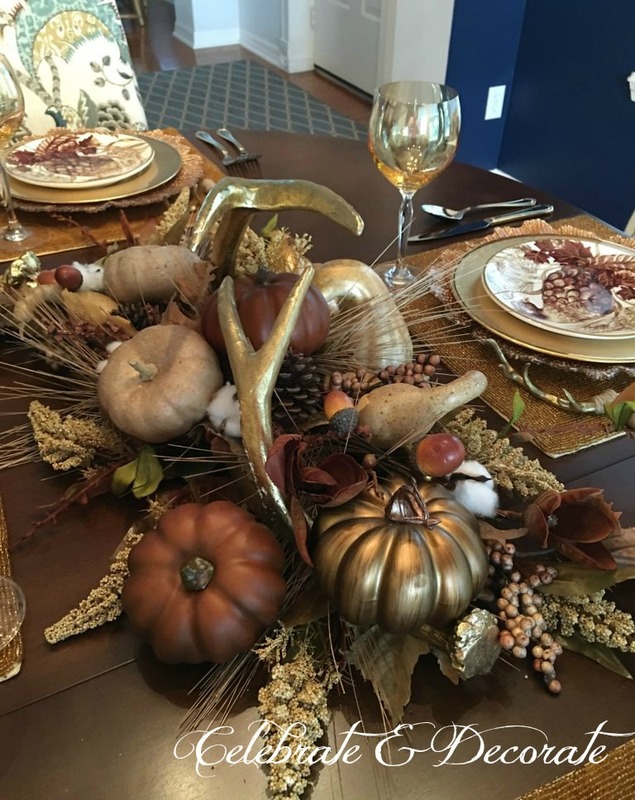 Of course it wouldn’t be a complete Fall home tour of my house without a peek at one of my pretty tables, all decked out in brown and gold for Fall. 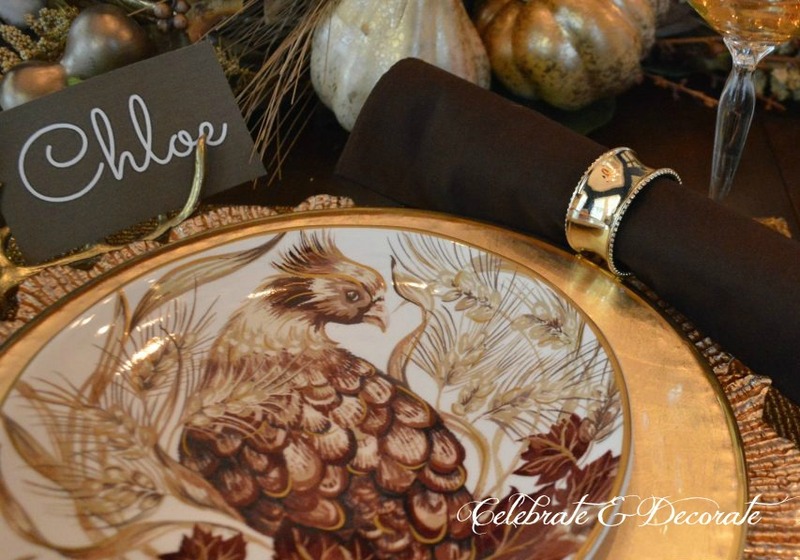 Please stop by my Golden Autumn Tablescape to see all of the lovely details of this table. I hope you enjoyed looking around my home for Fall! I hope you come back and see what I do for Christmas! The wheels are turning! I am ready to start planning for the big holiday season! You are incredibly talented! Love the detail in each photo and how well it all comes together…. Thank you Pam! I would love to have some bloggers visit someday! Thank you! When are you coming for a visit? Chloe, I so enjoyed your Fall tour this morning. 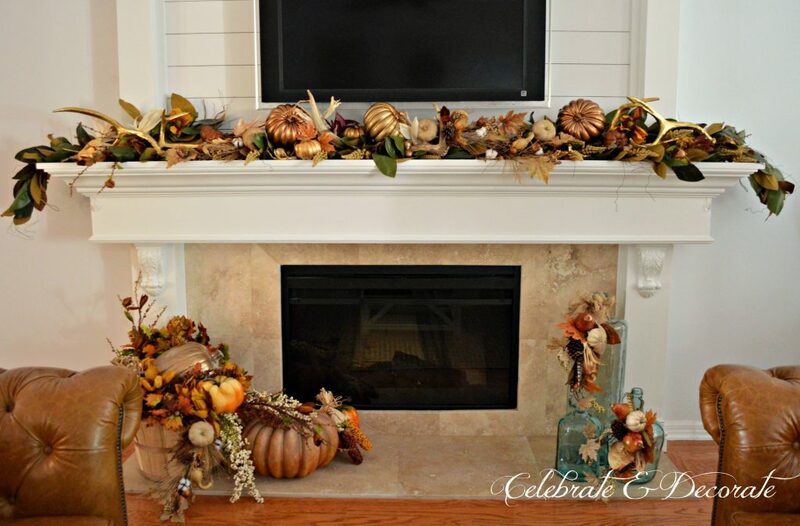 Your house is beautiful, and that mantel is simply stunning! I hope that you have a great day!!! Beautiful Chloe. I love the “extra” leaves on the porch. Mother Nature picks up where we left off. You have a beautiful home. Besides loving the wreath, I love the lidded box on the chest as well. A nice touch. Thank you so much Valerie. I am still not happy with the knob on that box, but I will find the right one someday! Hi Chloe, thanks so much for leaving me a sweet comment on my blog Little Brags. Your tour is gorgeous, can I come for Thanksgiving dinner now since the table is all set? Oh Christine! Thank you, you are so sweet! I haven’t gotten the turkey yet, I will get a bigger one so you will have plenty to eat! I enjoyed the fall home tour of your home. Very creative and inspirational. Chloe your home looks so festive and elegant but also very cozy and inviting! The fall touches everywhere are so lovely! I love how you put it all together. The decor is so warm and elegant. Chloe I will feature this tomorrow at Home Sweet Home! Oh my, thank you Sherry! I am so honored! 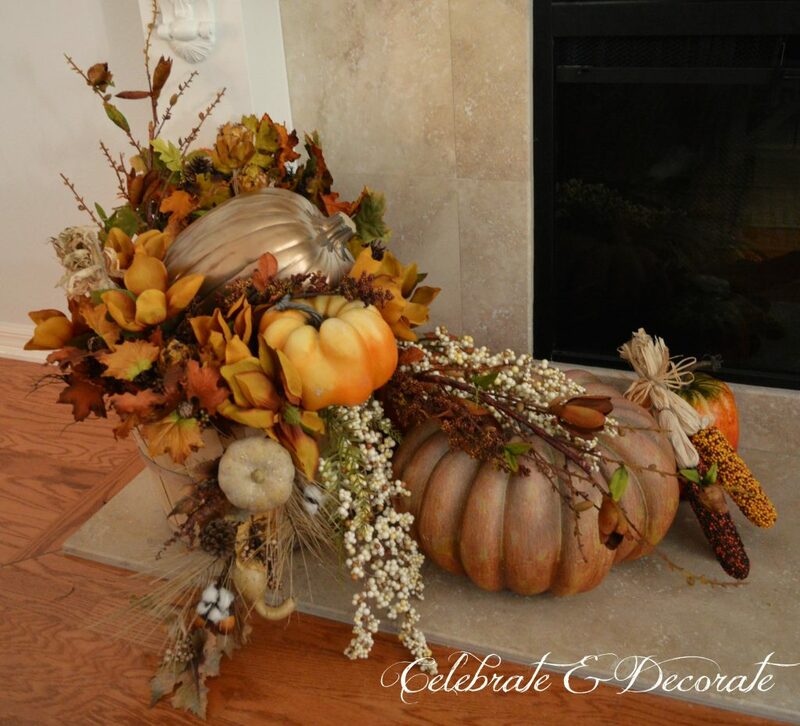 Your home is beautiful and your fall decor is amazing; from your entry to your lovely tablescape!